Selected CommunityViewer project/application views in Arizona. Integrating Census 2010 TIGER Shapefiles, ACS 2009 5-year demographics, Census 2010 demographics and related data. 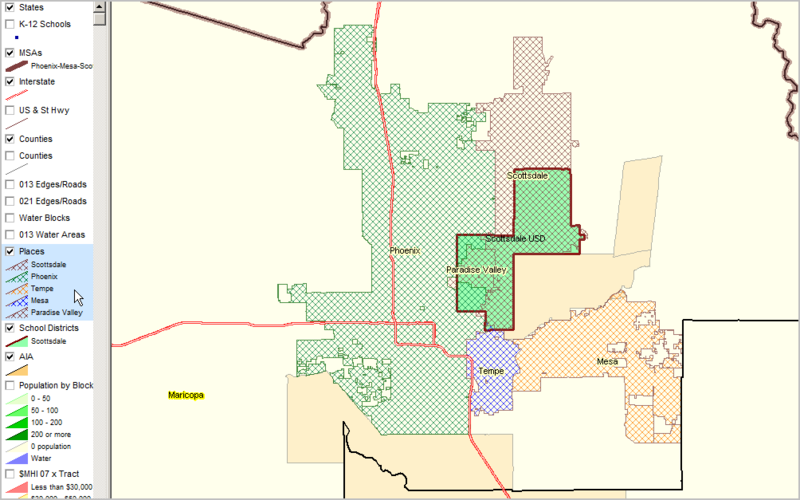 • Arizona school district demographics: http://proximityone.com/sd_az.htm. 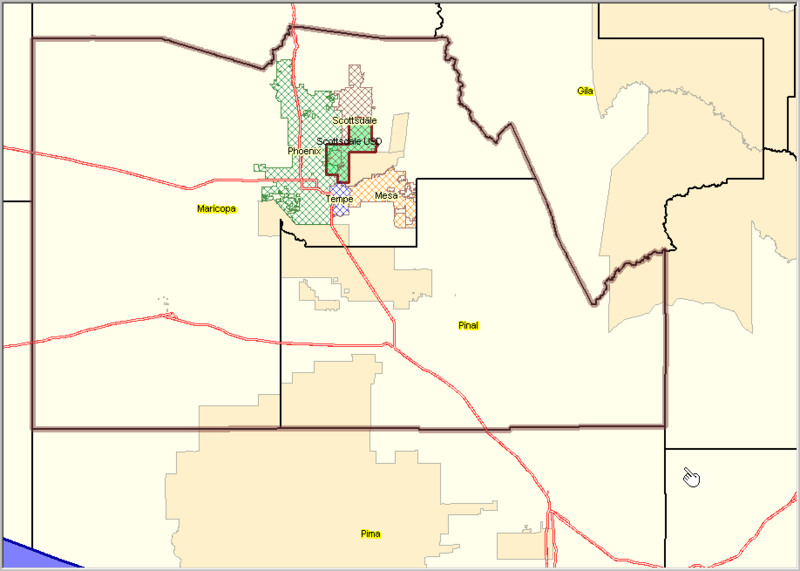 • Arizona census tract demographics: http://proximityone.com/ustr0509_az.htm. The table presented below provides a summary demographic profile for the city based on the Census 2010 P.L. 94-171 data. Similar to a profile developed by Census, this profile also includes two columns providing characteristics for the population under 18 years of age. These profiles are available for any Census 2010 geography, census block and higher level geography. The table presented below provides a summary demographic profile for the district based on the Census 2010 P.L. 94-171 data. Similar to a profile developed by Census, this profile also includes two columns providing characteristics for the population under 18 years of age. These profiles are available for any Census 2010 geography, census block and higher level geography. The GIS project fileset used to develop the views shown below is available for your use. Add your own data; create alternative views. 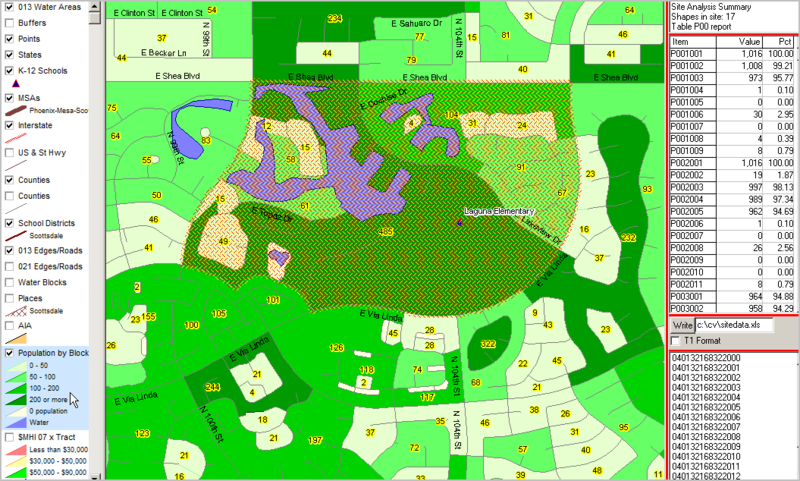 We can also provide custom map views or analyses to meet your needs. Contact us for details (888-364-7656). 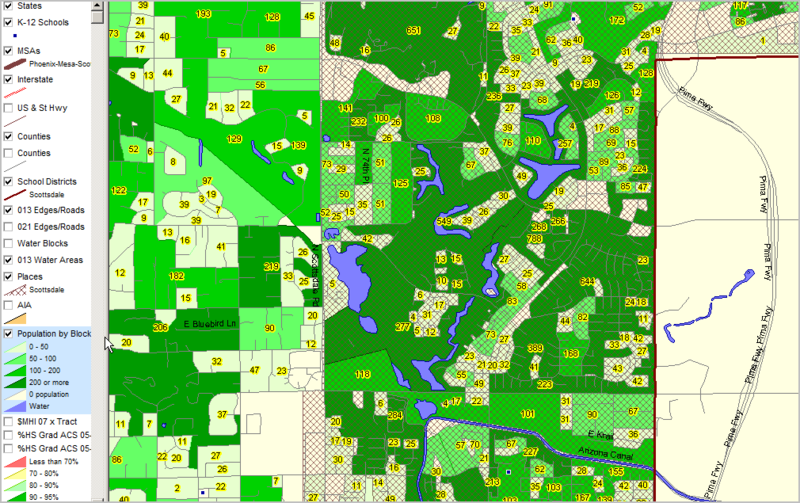 ... using ACS census tract estimates released December 2010 (http://proximityone.com/acs.htm). See interval/color pattern in highlighted layer (blue) in legend at left of map. Highlighted (blue) layer in legend (left of map) shows color/data value interval definitions. More about these data: http://proximityone.com/cen2010_blocks.htm. View similar to above showing total population by block as label. Intersection-to-intersection street detail and K-12 schools as blue markers. CV Site Analysis operation applied to census block layer; blocks "cherry-picked" in vicinity of school. In the graphic below, table in upper right shows 17 blocks (cross-hatched) in this study area. 1,016 total population in this set of blocks (p001001); 973 "White population of one race" (p001003) in this set of blocks. Item names shown in left column of profile defined at http://proximityone.com/cen2010_blocks.htm. List of geocodes for blocks included shown in lower right mini table. By clicking "Write" button, the summary data are written to specified spreadsheet file.